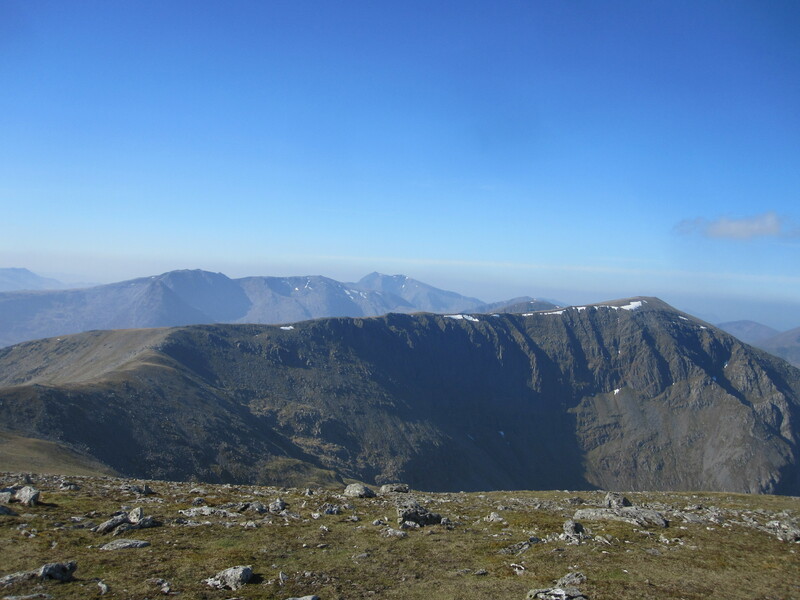 I’d never been up Ben Nevis before and had heard mainly bad things about the ‘Tourist Route’ -recently rebranded the ‘Mountain Track’ to imply a level of seriousness and to reduce the number of mountain rescue team callouts. 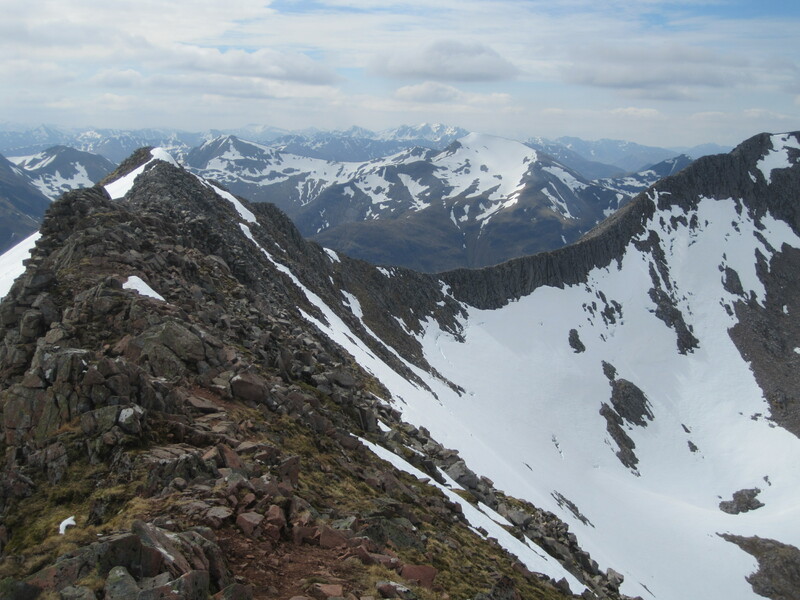 A bit of research led me to the Carn Mor Dearg Arete route (CMD arete). This route takes a more scenic and challenging approach from the Northern side of the mountain and an extended time on a high ridge. I followed a route from the Walkhighlands website. It began at the car park for the Glen Nevis visitor centre (Parking £3 for the day). The route begins along the river then picks up the main ‘mountain track’ as far as the ‘Halfway Lochan’. Here the tourist herd turn right and my route turned left. I wouldn’t see another soul for over an hour after this point. 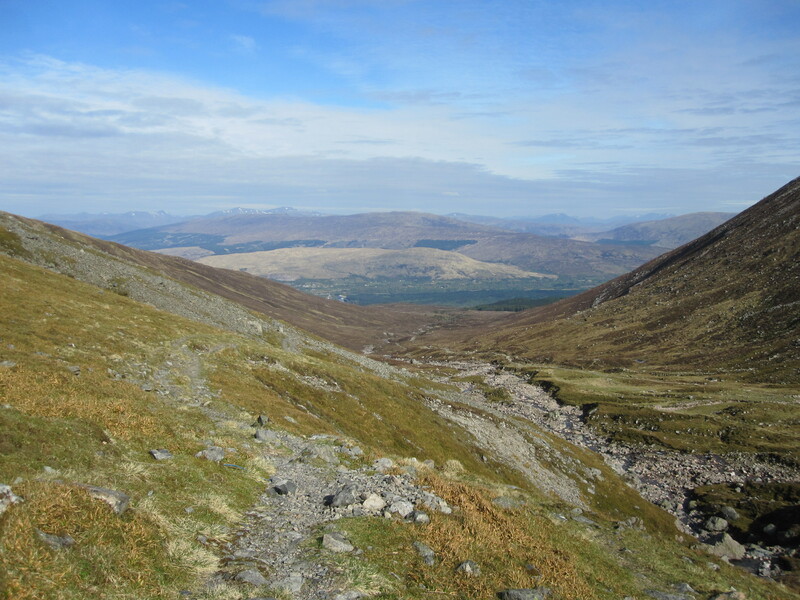 The path contoured around the end of the mountain before entering the valley between Ben Nevis’ North face and Carn Mor Dearg. After a while I reached the CIC hut, a private bothy for climbers. From here it was a steep climb over loose scree, boulders and up a snow field. Eventually I reached the ridge and stopped to admire the view. 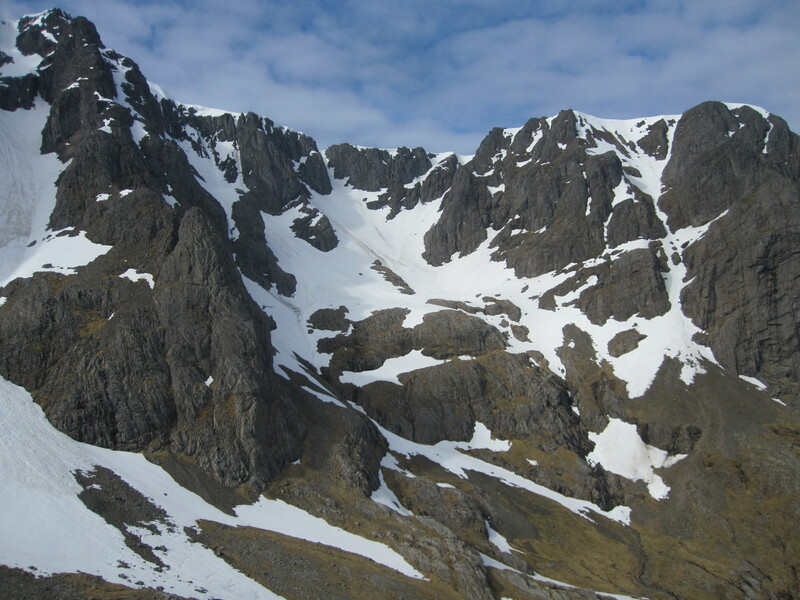 On my living room wall I have a large, framed poster of the North Face of Ben Nevis. Until today I’d never seen it. Now, the scene before me was the same as the poster. The famous ridges and buttresses spread out in front of me. The ridge was mostly clear of snow, only patches below the top remained. I was equipped with an ice axe and crampons but was glad not to need them. The scrambling wasn’t too difficult and the conditions were perfect; not a breath of wind and bone dry rock. Reaching the summit of Carn Mor Dearg I stopped for a brief lunch before continuing on descending first then re-climbing to the edge of Ben Nevis. Between me and the summit now was a steep boulder field without clearly defined paths. 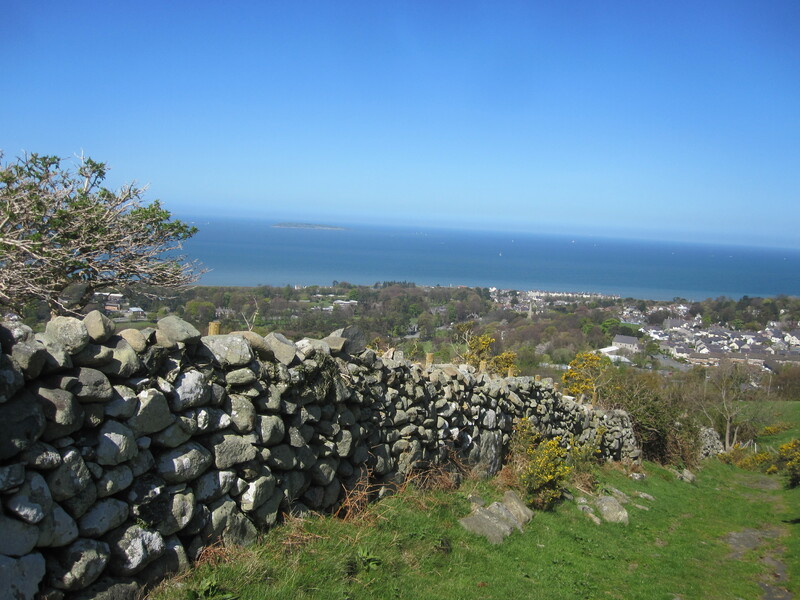 I scrambled, clambered, walked and shuffled upwards and towards the top. After an eternity I realised that the view ahead of me contained more sky than rock. I was nearing the summit! Spurred on I sped towards the blue. After hours alone I reached the summit and the hordes of tourists enjoying the May sunshine. 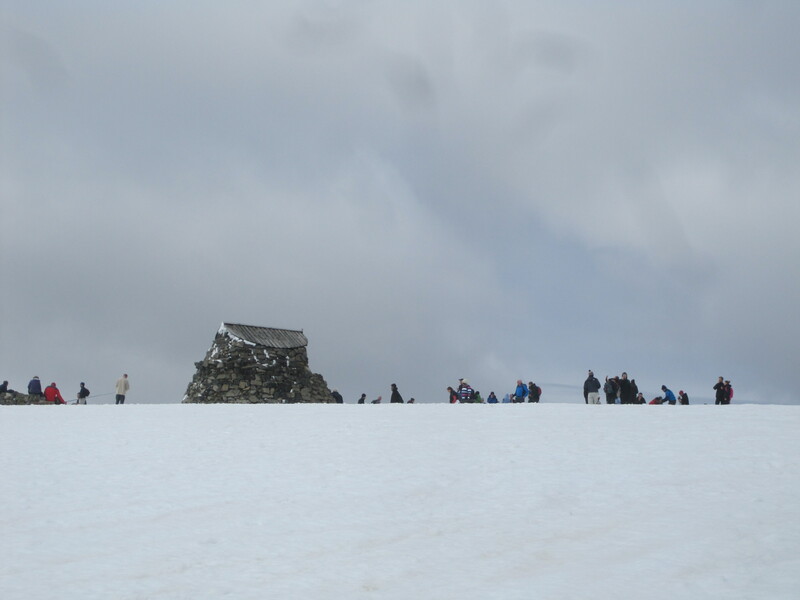 There were dozens of people sat, wandering, being photographed, exploring the summit. The trig point was crowded, the ruins surrounded. There was even what appeared to be a fridge strapped to someones backpack! The weather forecast had said there would be rain later in the afternoon and I didn’t want to wait for it on the summit of the UK’s highest mountain. After ten minutes I was off again. As part of my preparations I’d marked my map with the bearings and distances for the safe descent in poor visibility. I could clearly see the way down but for interests sake I followed the compass bearings to see how it compared to the ground in front of me. The route taken by the masses closely matched the bearings I was following, so I followed the people and the footprints. The descent route was still very deep in snow so I used a ‘ski-less’ skiing technique to get down quickly. 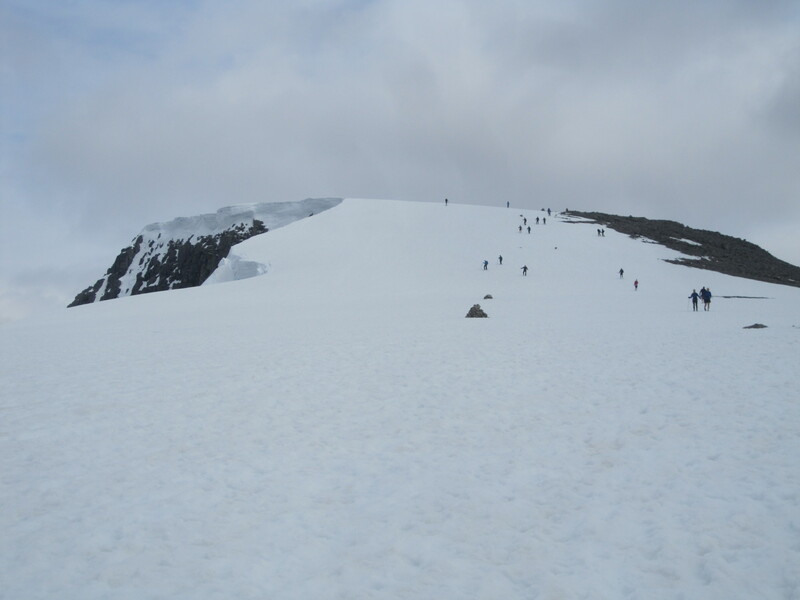 Slipping, sliding and skidding down the snow field to the zigzags of the mountain track. The snow cover extended far past the top of the zigzags and so I decided to keep on sliding, skidding and slipping down the mountain. Most of the crowd had by this time returned to following the zigzags but a few of us remained on the snow. The direct route over the snow saved so much time over the tedious looking zigzags I was back at the halfway lochan in no time. Stopping to remove my gaiters and have a drink I looked back up, impressed at the ground I’d covered. Back on the mountain track I was back at the car in a little over an hour. Overall I’d been out for 8 hours 10 minutes. The guide reckoned 10-12 hours! Travelling over the snow had definitely been worth it. I’ve visited Snowdonia several times over the years, never backpacking and never in the Carneddau. Always went to the South side of the Ogwen Valley road. 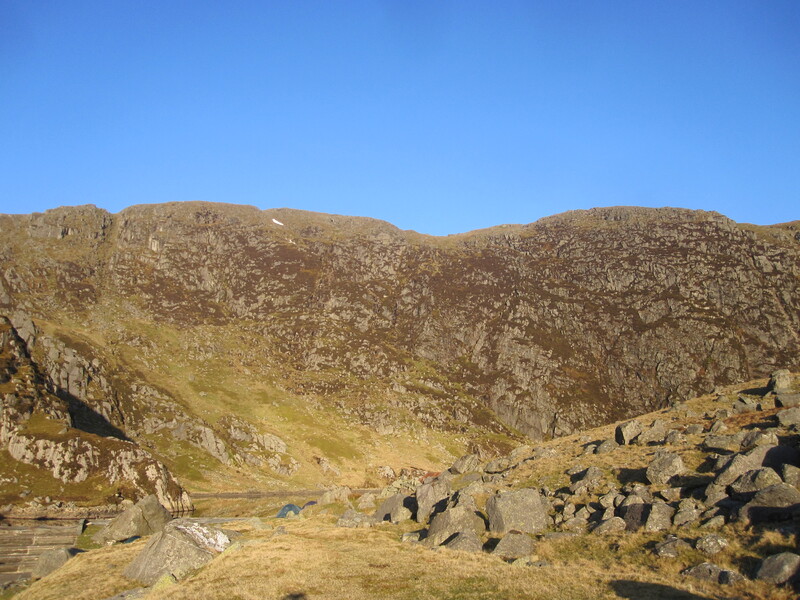 During the ML training we spent two days wandering around the Northern end of the Carneddau. It really whetted my appetite for a further exploration. Maps were ordered, received and studied, Google Earth was zoomed, panned and tilted and a plan was formed. I realised that I could take the train to the North coast and make a four-day circuit of the area, taking in many of the main peaks. Easter weekend became the obvious choice of dates, four non-working days where my wife would be able to look after the children without taking any of her precious leave (which she ran out of months before, the perils of a ‘normal job’). The return train ticket from Bradford to Llanfairfechan (a short distance before Bangor) was about £45, not too far off the cost of diesel in the car and without the hassle of finding a suitable parking spot for four days. 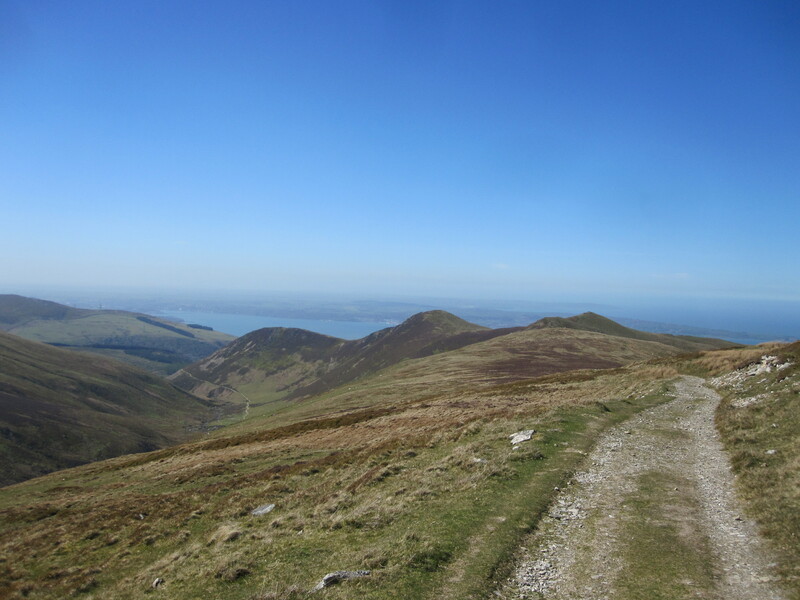 From Llanfairfechan I could be into open countryside, climbing into the mountains within 2 miles, it was the ideal starting point. Excitingly I discovered en route that Llanfairfechan was a request stop and I needed to speak to the guard to ensure the driver knew to stop! The departure required me to flag down the train to get on board -I never knew this was ‘a thing’ that one could do in the UK. 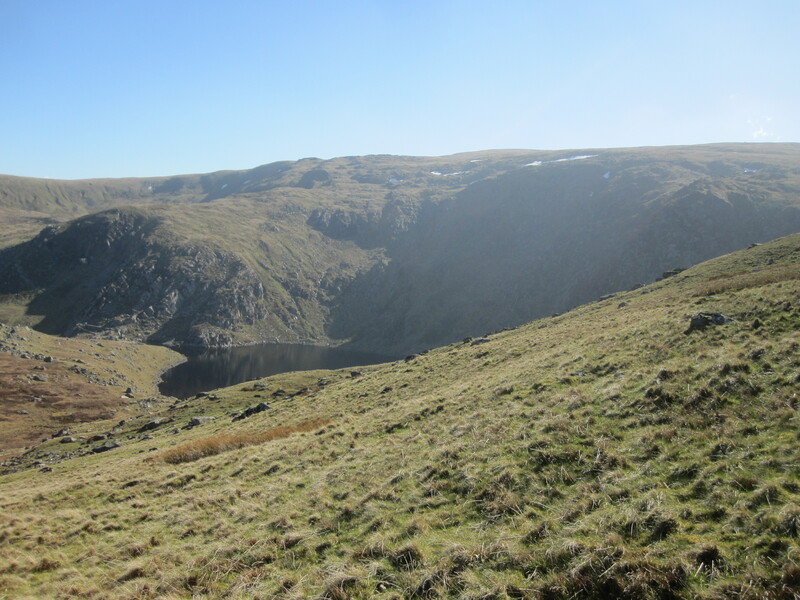 My only previous experience of the Carneddau was in the Llyn Anafon area – an attractive spot a few miles inland from Aber Falls. My first day’s walking took me over some familiar ground into the mountains. 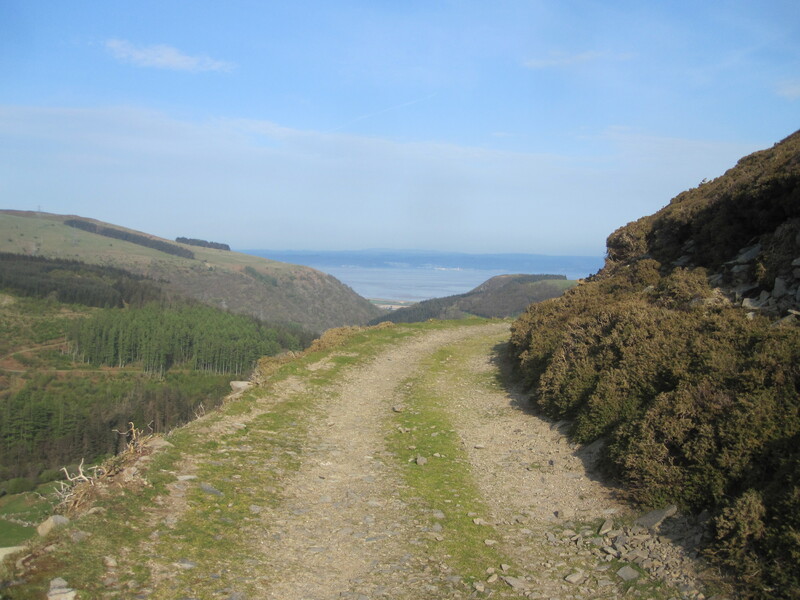 From Llanfairfechan I followed a good trail to the west of the Anafon valley over Foel Ganol up to Drum. The sun was shining and the air was warm -quite unlike my last experience of North Wales which was positively Wintery. I stripped to baselayers and fixed the solar panel for my PowerMonkey charger onto the top of my backpack. A few Km into the walk I came across a group of three Americans, exploring the area before heading off elsewhere on a European tour. They were holding up a guidebook and trying to fit its sketch maps to the view in front of them. “Hi” one of them said to me, “Is this Drum?” he continued, pointing at a hill to the East. “No” I replied. “Drum is a few Km further on, you can’t see it from here”. I took my OS map from my belt pack and showed them. “Wow, you have a topo!” he said, sounding genuinely impressed. I showed them Drum and we all carried on together along the track chatting. After a few hundred metres more we’d separated, they stopped for photos and I carried on ahead. As I wandered alone I began to daydream. I thought ‘wouldn’t it be cool to bump into Chris Townsend (Backpacking legend) when out in the mountains’. I looked up from my thoughts and heading towards me was a familiar face. Not Chris Townsend, but Dan English. A friend I’d met on the ML training months before and had since been backpacking around Helvellyn with. “Hello!” I said, with a broad smile and most likely a surprised look. “Hi, fancy seeing you here” he replied. We walked together to the summit of Drum, from where Dan had recently left. We sat and chatted a while, discussing our plans and discovered that we planned to wild camp in the same place the next night. After a short break we said good bye and went our separate ways. As I approached the reservoir I kept my eyes open for a suitable place to pitch my tent for the night. There were a few spots here and there above the lake I made a mental note of one or two as I passed. Before pitching I went to check out the bothy, an old mine building a few hundred metres from the lake. 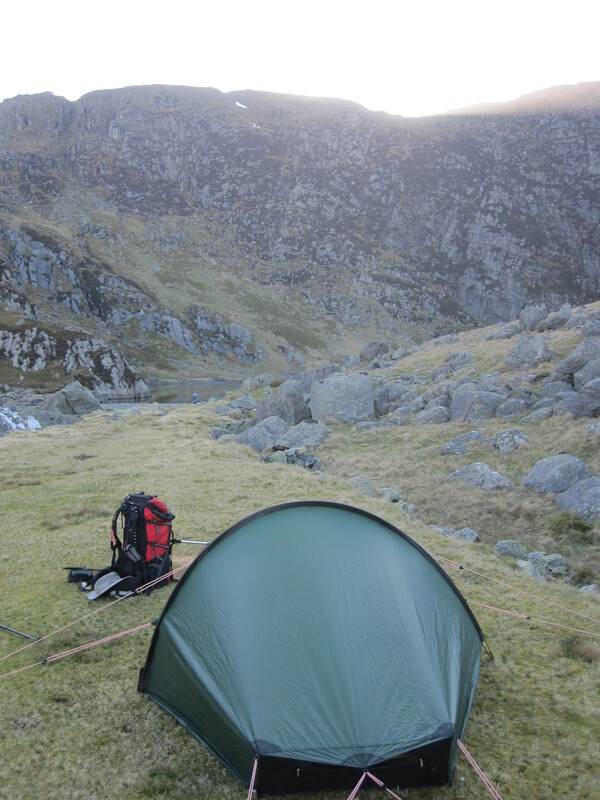 As I took the trail for the bothy I saw the perfect wild(ish) camp site. An area of perfectly flat ground -obviously man-made not far from the lake shore. That was the place for me! The bothy is a small hut, containing two rooms, one sleeping and one communal cooking area. There was a small dome tent pitched on the front porch area. I opened the door and received a friendly greeting from the occupants. About 5 people were there, all set up for the night. They asked if I was going to join them, I told them no, I would camp near the lake. I left the bothy and returned to my perfect camp spot. I put down my pack and got out my Hilleberg Akto. Within a few minutes it was up and I was moving in. The weather was perfect for wild camping, clear skies, not too cold. The ground under the tent was a little hard but the pegs went in deep enough for me to be happy -perhaps not too happy in a storm! After I’d got myself set up and a brew on a group of five more people arrived, looking to camp. They told me there were now about ten people in the bothy. That would make for a warm night in there! Dinner was ‘look what we found’ meatballs and a pasta mugshot (tikka). It tasted fine and was the heaviest meal in the bag so I was glad to eat it first. As the evening went on I wandered on the hill above the reservoir took some photos and watched some of the wild ponies graze. As usual, I was in bed before 10pm. A nocturnal need had me getting out of them tent at about 2am. I saw the most amazing night sky. So many stars! I’m always happy to have woken up when that is my reward. The second day dawned cool and clear, another cloudless sky. After a quick breakfast of Alpen I packed my kit away and set off uphill towards Melynllyn, a smaller lake slightly higher than Dulyn. A clear track, presumably used by the miners led the way to the second lake. The bothy was clear to see back down the valley and the calls of birds could be heard. At Melynllyn I took out the map to decide where I was going next. I had an idea of where I wanted to go, just not exactly how I was going to get there. Looking across the lake I saw the mountain walls that I needed to be on top of. The most sensible approach was to climb up the shorter hill to the left and then circle around the lake from above. After a short climb I followed a stream onto the top of the hill. The views were excellent, back to the North from where I’d come and down to the South West towards Carnedd Llewelyn and South to Cwm Eigiau. Studying the map I decided to head towards Llewelyn and from there take a ridge to the South East towards Pen yr Helgi Du. 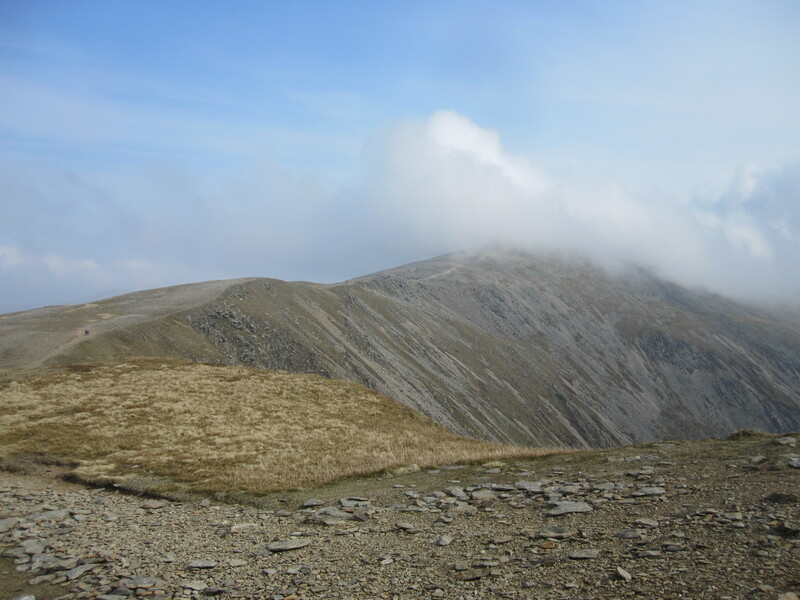 It was easy enough to get to the summit of Carnedd Llewelyn as the weather was good but the ground was fairly featureless from this side, it could be a different proposition in mist or darkness. The views South West from the Llewelyn summit are amazing. The black ladders (Ysgolion Duon) of Carnedd Dafydd look imposing from across the valley. The ridge SE from Llewelyn looked fantastic walking. 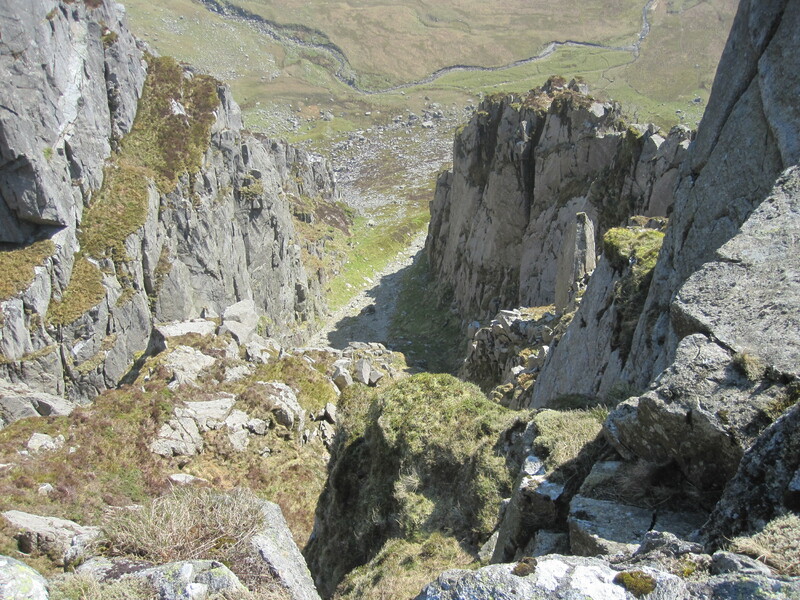 Undulating a little, with sheer cliffs on the Northern edge, terminating with a scramble up the edge of Pen yr Helgi Du. The walking was great, comfortable terrain, great views, great weather. I looked ahead at the scramble up Pen yr Helgi Du, hoping that it was ‘just’ a scramble and I wasn’t going to get stuck halfway up and need Ogwen valley MRT to come and unstick me. The ridge walk was fairly quiet, in fact, I’d not really seen anyone since I left camp in the morning. 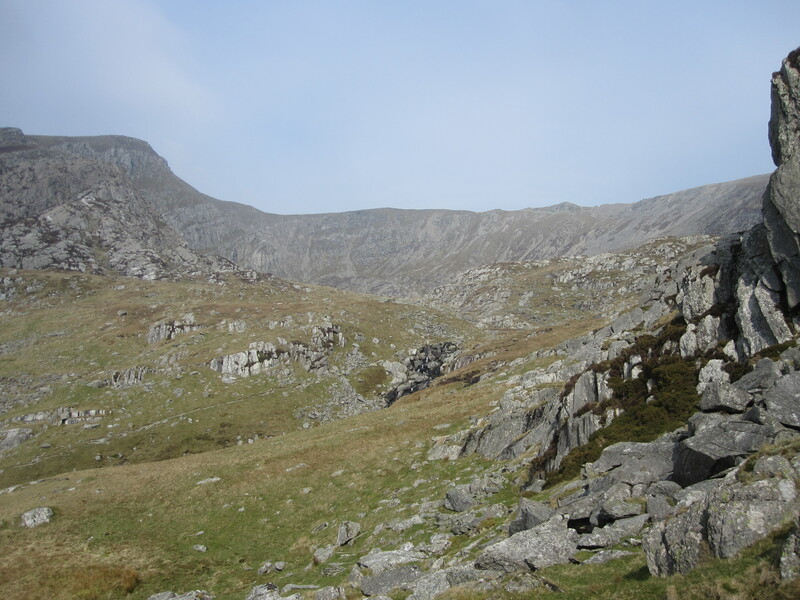 The Carneddau really are the quiet side of the Ogwen Valley -unjustifiably so, there is great walking to be had here. After a while I came to a steep downward section of ridge and I needed to put away my poles and get my hands on the rock. I love scrambling but it really is a lot better when you’re not carrying a heavy backpack. I was getting closer to Pen yr Helgi Du and I was confident that I could make the summit without issue. There was a path off to the side if I needed a last minute change of route. Keeping my poles strapped to my pack I began the climb up the edge of Pen yr Helgi Du. The rock was firm and dry, the sun shining. It felt great to be scrambling alone, hardly a soul in sight as I ducked and weaved between overhanging rocks to the summit. I gained the summit and found I had the whole plateau to myself. Taking advantage of the solitude I dropped my pack, took off my boots and socks and lay down in the sunshine. After re-fitting by boots I carried on, following a compass bearing towards Pen Llithrig y Wrach and a col between the mountains. I stopped for a lunch of Primula cheese, Chorizo, Tuna and Pitta breads on the rocks of Bwlch Tri Marchog. Looking at Pen Llithrig I thought it looked uninspiring and debated whether or not to bother with it. I decided to climb it, for completeness sake, but without my pack. I stashed my backpack behind some rocks and set off unencumbered to the summit. There and back was less than an hour and I was right, it was uninspiring. Decent enough views down the far side though! Returning to my pack I now set off contouring around the hillside towards Glan Llugwy and the track to the lake. I followed faint animal tracks through the heather and then climbed onto the Southern spur of Pen yr Helgi Du. Ffynnon Llugwy came into view far below and I needed to pick a route to get down. Directly beneath me were steep rocky drops so I walked South a little way to a boundary fence and descended to the access track to the lake. As I was hoping to meet up with Dan this evening I thought I’d best chose a pitch which would be visible to him on his approach. I checked the map and decided where I thought his most likely approach would be. I pitched the tent on a finger of land which lead into the lake. It was decently flat and not too exposed as the forecast was more increasing wind and some rain. I got the tent up, made a brew, boiled some water for the evening and went for a lie down in the tent. A short while later a familiar voice outside asked if anyone was home. Dan pitched his tent near to mine and we set about making our dinner. I went for the gourmet option of a packet of Mediterranean vegetable cous-cous to which I added some chunks of chorizo and chopped up dried apricots. It tasted fantastic! We joked about our last trip where I’d experimented with a packet of mixed grains with Quinoa. I somehow managed to burn this and leave it cold! It was horrid. I’ll be sticking to cous cous or pasta in future. The evening grew chilly so we both took to our tents, continuing the chat through sheets of nylon. There were three other tents pitched about the lake that evening. Unsurprising really as it was a short walk up from the road. The next morning brought light showers and a breeze. We packed quickly and set off our separate ways. Dan had originally thought of joining me on the first few Km of my walk towards Pen yr Ole Wen but changed his mind when he realised he could instead head for the Moel Siabod cafe for a fry up! We parted company at the road head and I began to climb up and over Craig Llugwy towards Ffynnon Lloer and Pen Yr Ole Wen. Many times I’ve seen Pen Yr Ole Wen from the campsite in the valley (Gwern Gof Isaf) and fancied walking up it, especially something scrambly but I’d never got around to it. Approaching ‘Ole Wen’ from the East I could see the rocky spur where I’d find a route to the summit. Arriving at the lakeside I found what looked like a path heading up into the rocks. It looked like a sensible scrambling route so I put away the poles, adjusted the pack and set off upwards. The scrambling was great fun. Good holds, good foot placements and brilliant views. One part was a large, smooth slab with nobbles of quartz poking out. On a wet day a slip here could have been very serious I thought as I scrambled up. After a while I reached the summit and enjoyed the views back over the Ogwen Valley. 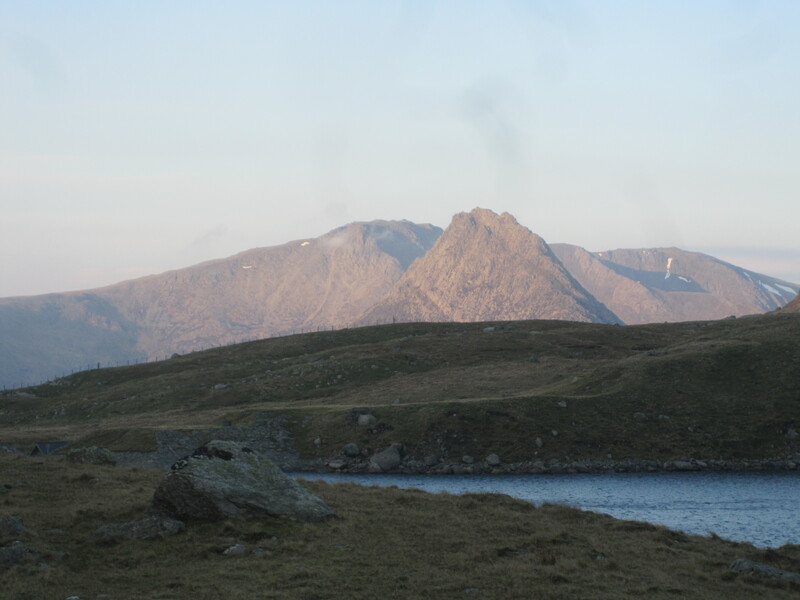 Familiar peaks of Tryfan and the Glyders. I made a note to climb Y Garn next time I’m here it is a very attractive mountain. The weather forecast today predicted poor visibility and strong gusts on ‘exposed ridges’ -much like the Carneddau ridge that I would be on in an hour or so. Ironically, the poor visibility was easy to see, a wall of mist creeping down from the North East and I was walking straight towards it. I set off towards Carnedd Dafydd and before I was halfway there I was in thick mist. The wind, as predicted picked up and I was suddenly very cold. I made a quick stop at a cairn shelter to add layers, check and set compass bearings and was on my way again. I got to Carnedd Daffydd in a short time and reset the compass. There was a family of about six people taking shelter and deciding what to do. I set off into the mist, all too aware of the sharp drop from the black ladders to my left. Typically, that was the direction the wind wanted to push me so I kept a fair distance from the edge, but close enough that I could see it and use it as a ‘handrail’. 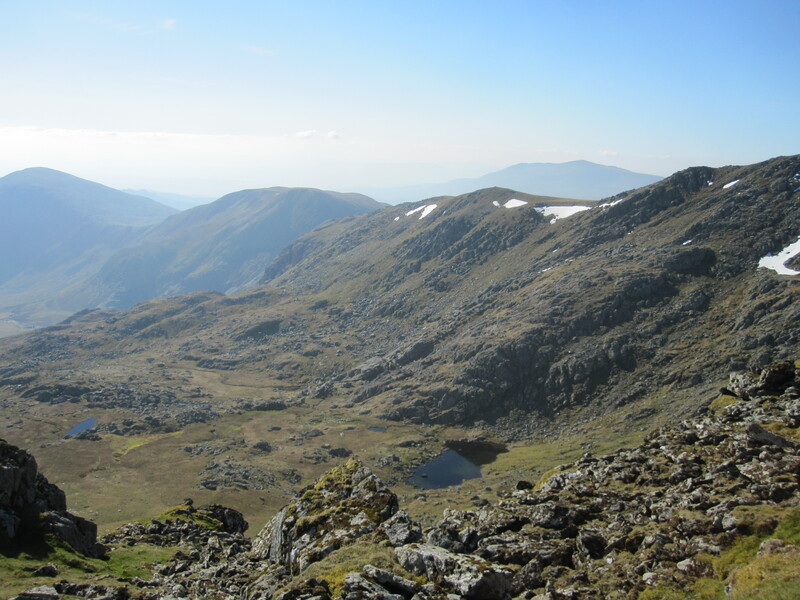 After what felt like hours I got to the ascent up to Carnedd Llewelyn. This felt like hard work. I was hot in my layers, but would have been cold without them. I got to the summit about midday but didn’t want to hang around to eat my lunch. 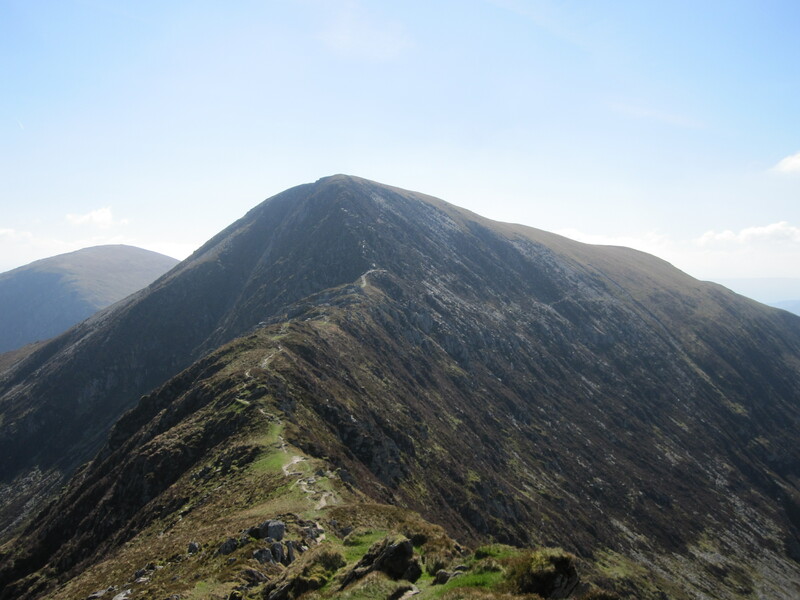 I rechecked the map, reset a compass bearing and strode off towards Foel Grach. A voice behind me caught my attention. A man from a group of three friends and a dog asked if they could walk with me as they were unsure of the way. I said they could but made no promises as to competence! Finding the path was tricky, the limit of visibility was perhaps 10-15m and the best I had to go on was a bearing from the day before, when it was clear. We walked a little way, found a faint track which was close enough to my expected bearing so we followed it, chatting as we went. After a few hundred metres I began to doubt we were on the right track. I stopped, checked bearings, contours and all the other bits on the map. We had drifted slightly to the East and downhill. I set a new bearing and we started off, regaining some of the height we’d lost. The going was OK, terrain fairly firm and grassy. After fifteen minutes or so we arrived at what we believed to be the rocky summit of Foel Grach but there was no sign of the shelter I’d been expecting to find there. We searched a small area but to no avail. I was certain we were at the summit, but where was the shelter?! I took out my smartphone and used an app to get a grid reference. A minute or so later our location was confirmed. We were at the summit, only about 20m from the shelter. We walked towards where the map said the shelter was and almost missed it. The mist thinning just enough to make it out. We piled into the shelter glad to be out of the wind. It was small and dark, really not a place to spend a night except in an emergency. I ate a quick lunch and we put on the packs, locked the shelter behind us and walked off towards Foel Fras. 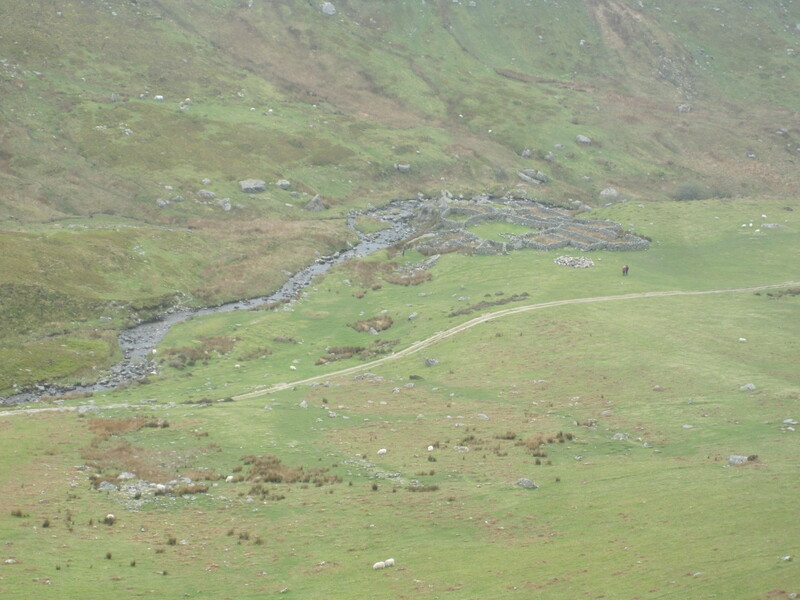 After Foel Fras the wind abated and the mist lifted (or perhaps we descended below it!) We could now see the hills in front of us and some of where we’d come from. Drum was the next hill and we passed with only a brief stop at the summit. We continued down the track where I’d begun my journey. My fellow travellers were heading for Rowen and a well-earned pint. I said good bye and set off to Pen Bryn Du and a descent into Afon Anafon. I was aiming for an old sheep fold where we’d stayed on the ML course. It was flattish ground and the walls made a good wind break. Following a stream down into the valley floor my home for the night came into view. The night was peaceful. I spent a lot of time just soaking up the views and drinking coffee and hot chocolate. The next morning was calm and clear. I felt no urgency to hurry so I made a brew, ate my breakfast and enjoyed the morning before packing away. The track out was easy walking and each step gave better views to the North and the coast. After a few hours I was on the coast. 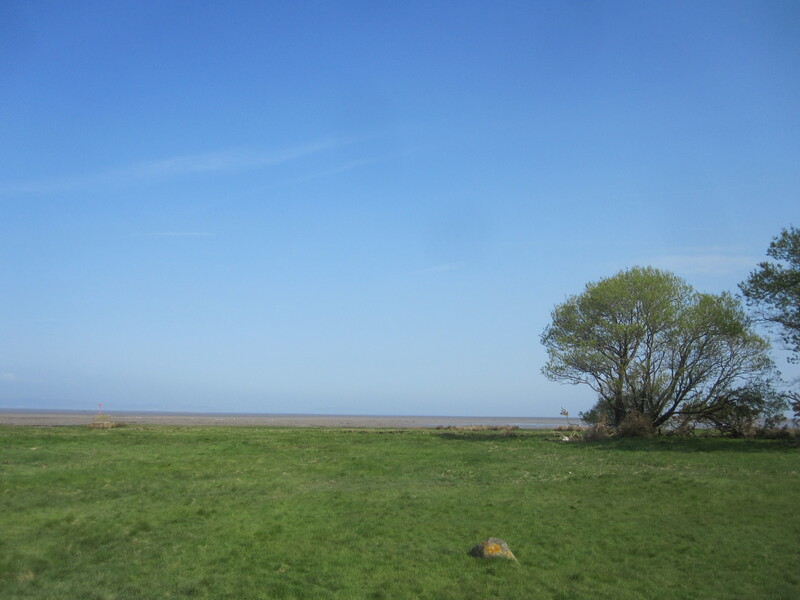 The last few miles on the North Wales Coastal path back to Llanfairfechan and the train home.